Anthrax Vaccine -- posts by Meryl Nass, M.D. This blog began in 2007, focusing on anthrax vaccine, and later expanded to other public health and political issues. The blog links to media reports, medical literature, official documents and other materials. Why did the DOE's Lawrence Livermore National Lab produce a 2015 study suggesting that anthrax was NOT used as a bioweapon in Rhodesia's civil war? Rhodesia is no more, having been renamed Zimbabwe after it became a majority-ruled black nation in 1980. Rhodesia was a British territory before 1965, when the 5% white minority seized control to preclude Britain granting majority rule. A civil war ensued, with the two sides divided by race. By the war's end in 1980, the black "guerrilla" "terrorist" "communist" side had been attacked with chemical and biological weapons including organophosphate "nerve gas," rat poison, cholera, anthrax and arguably other chem-bio agents. I was first to publicly identify this anthrax epidemic, which killed at least 182 people and affected 10,000, to be an act of biological warfare, in 1992. Subsequently much literature (scientific, historical and memoir, originating from Zimbabwe, South Africa, the UK and US) has amplified the evidence base and added details, though much remains hidden. Of interest, this confirmatory literature includes a report from the US Naval War College and US Air War College, and a book and related episode of BBC TV's Panorama. The history of anthrax biowarfare in Rhodesia seemed incontrovertible. I was forwarded a report produced in 2015 by a scientist at Lawrence Livermore National Laboratory (LLNL), disputing that the Rhodesian anthrax epidemic was due to biological warfare. The study was published by LLNL, rather than in a peer-reviewed journal, yet it required considerable resources to produce. The report ran to 43 pages and 56 footnotes. To make the case the epidemic occurred naturally, the report's author, Stephan P Velsko, employed a method he termed "opinion calculus," by which he transmuted the actual facts of the epidemic into opinions and (often incorrect) assertions. He then assigned weights to the opinions and assertions (the weights being his opinions) and used a mathematical construct, Dempster-Shafer theory, to impart a scientific veneer to the gobbledygook calculations. Unable to marshall any evidence to support his conclusion that biological warfare did not occur, Velsko jettisoned all the existing evidence to instead favor the absence of evidence, claiming, "Many items of evidence that have been proffered over the years are shown to be nearly irrelevant to the final conclusion, while the absence of certain expected types of evidence plays a critical role in the assessment." 1. Although anthrax cases were required to be reported in Rhodesia, Velsko disputes the meaning of the huge size of the epidemic, suggesting it was inflated by poor quality reporting. While reporting rates for any rare disease always increase as doctors become more familiar with it, Velsko never mentions the fact that the Rhodesian event remains, by far, the largest anthrax epidemic in world history. 2. Velsko denies that the epidemic jumped from district to district in a geographic and temporal pattern unknown to other anthrax epidemics, twisting the history. He claims instead that the epidemic was localized to one epicenter, with nearby peripheral cases caused by transport of meat. In order to make this claim, he omits the considerable evidence of when and where cases occurred. However, I previously recorded the dates and locations of cases using Zimbabwe's public health records and other sources. 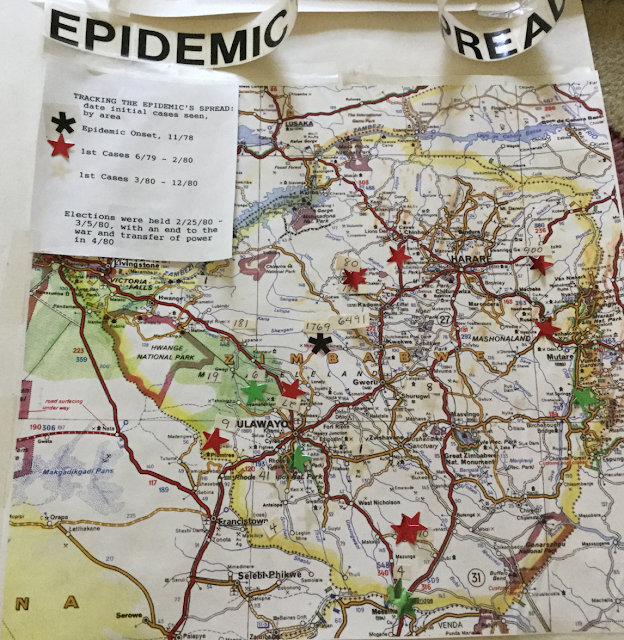 Below is a new photo of the map I annotated in 1992 with multicolored stars for reported anthrax case locations, and numbers of cases, where known. Some of the stars have gone missing, but it should be obvious that cases were identified widely within Zimbabwe's borders (marked in yellow). Visible, but more difficult to see, are the case numbers which, despite Velsko's claims, were considerable from east of Harare to northwest of Bulawayo. Additionally, the star colors indicate the temporal movement of the epidemic to new areas over a 2 year period, a feature unique to this epidemic. 3. Velsko challenges the validity of an ex-Rhodesian intelligence officer's report, simply because anthrax spores were referred to as "spoor." Velsko writes, "the mistaken use of the term “spoor” instead of “spore” leads one to suspect that the author of the letter did not have direct experience with B. anthracis, and was at best quoting others." However, "spoor" is the correct term in the Afrikaans language (spoken by the white Afrikaaners of South Africa) for spore, and in common use to denote anthrax. While I don't expect Velsko to know Afrikaans, his argument encapsulates the confluence of ignorance and flawed reasoning that characterize the entire report. Although I could go on about the misleading claims and suppositions in this "study," the real question of interest is why did the DOE's Lawrence Livermore National Laboratory, a storied federal center for studies of nuclear, chemical and biological weapons, including anthrax, choose to dispute that anthrax biowarfare took place in Rhodesia? Why now, 37 years after the event, and 23 years after my paper was first published? Velsko is a math and microbial forensic guy who has written on techniques for establishing the forensic origin of disease. He has also written on the anthrax letters, and on scientific validation in microbial forensics. I don't think he is a fool. Is he a knave? Did Velsko/LLNL simply choose to experiment with a new technique, and picked the Rhodesian anthrax epidemic to study, randomly? If so, why choose a technique that heaps guesswork on guesswork, while ignoring the available data? That ain't science and I'd wager Velsko knows it. Why was this report written? The report's conclusion, that Rhodesia's anthrax epidemic was probably a natural occurrence, may be the first volley of an effort intended to alter history. Why would a US government lab want to do this, unless the US government had some involvement in that history? Here's another scary possibility: the US government finds itself stymied by the existence of a method that can distinguish whether an epidemic is deliberately caused, or a natural occurrence. A major reason to use a biological weapon is that the resulting epidemic will be assumed to be natural, and go undetected as an offensive act. A further reason to use a biological weapon is that it is almost impossible to detect who did it. [Consider the anthrax letters attack and that we still lack proof of their perpetrator.] Velsko and LLNL know this: this is their field, after all. Might Velsko and his employer LLNL/DOE/USG be trying to weaken the scientific underpinning of biowarfare epidemic analysis, an analysis that could be used outside US Government-approved channels, to make the investigative techniques appear much softer and less reliable than they really are? Might this be an effort to prevent their future use to detect a biological weapon attack? Most-cited papers of mine include one investigating Zimbabwe's major anthrax epidemic and a review of anthrax vaccine's usefulness in biological warfare. A November, 2001 Congressional testimony in response to the anthrax letters may also be of interest. Below, I've posted photos taken when I'm not at work or in front of the computer. Contact me at merylnass@gmail.com or 207 412-0004 when I'm home. Rhesus macaque: "I need three hands for this meal"
Because life is meant to be lived! The left side of this blog has photos of some peak experiences. And the right side contains information about which I am passionate. Too many peoples' lives are characterized by lack of authenticity, and fear of acknowledging and expressing their true nature. Employees cannot say what they think at work, and in the corporate system we must squish ourselves into square holes when we are round pegs. We thus lose touch with our souls, becoming cogs in a soulless, profit-driven machine. The culture of political correctness has meant, in medicine, that we ignore how the foundations of our science are being undermined by commercialism. Clinical data generated or presented by the manufacturers of drugs, vaccines and devices cannot be trusted: there are hundreds of studies proving this. But this fraudulent information continues to be the only data informing the approval of vaccines, drugs and devices. Unless scrupulous ethical conduct is demanded of physicians and biological scientists, our lack of meaningful standards will carry the medical-pharmaceutical system down the path of increasing irrelevance. Medicine and its tools need to be affordable. The current medical-industrial milieu, characterized by contempt for science, countless ways for insiders to achieve wealth due to failure of good governance, and regulatory agency-to-industry revolving doors, has ushered in stratospheric pricing... further kicking us down that path to irrelevance. Why is our new health care plan a giveaway to health industries instead of to health consumers? Why won't it cover all Americans? Why was the "public option" never an option for the Obama administration? Why did the promised Trump health plan evaporate the moment he was elected? So many of our leaders carry a heavy burden of mendacity and avarice. If they instead got in touch with their own souls (perhaps by exposure to the natural world), or made their decisions by maximizing the amount of good that results, our leaders might find real meaning and value in their lives. Until that happens, the only way to straighten out the current mess is to demand accountability and impose penalties on unethical/dishonest leaders. Both political parties enjoy bounteous hors d'oeuvres from Pharma's table, making it unlikely the existing political "process" will provide relief--as we've seen in the demoralizing healthcare reform drama. Until then, I'll continue to "call it as I see it" in this blog -- working and living the way life should be, in rural Maine, far from the centers of power. Ellen Byrne has created several designs encapsulating aspects of the FBI's ridiculous case against Bruce Ivins. They can be purchased on T-shirts and coffee mugs. All proceeds will be donated to the the Frederick County chapter of the American Red Cross, a favored charity of Dr. Bruce Ivins. New insights into the pathogenesis and treatment of anthrax toxin-induced shock.